Bernd Everding of the Starriders Drum & Bugle Corps submitted this classic photo and caption. 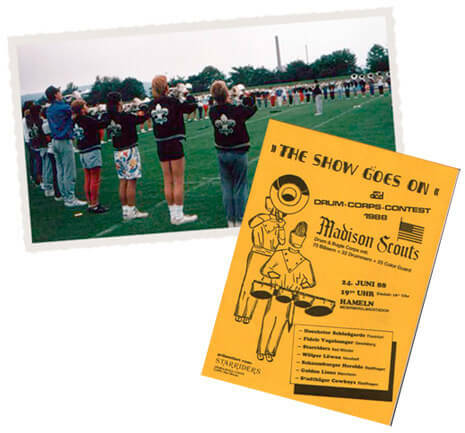 In 1988 during the Madison Scouts' European tour, they were guests for four days in the hometown of the Starriders Drum & Bugle Corps in Bad Muender. The town is near Hamelin, Germany, known from the fairytale of the Pied-Piper. A lot of drum corps fans from all over Germany came to join the Scouts during their open rehearsal and clinic seen in this photo. It was a great pleasure to be the host of this fantastic corps in their 50th anniversary year and to present the Scouts in our yearly home show as a very special guest.